CU Boulder research could help determine if a double amputee can compete in 2020 Tokyo Summer Games. KUSA — Blake Leeper could be the first double amputee to compete in the Olympics since Oscar Pistorius, and researchers at the University of Colorado Boulder are playing a big role in possibly getting him into the 2020 Tokyo Games. Leeper was born without legs and uses prosthetic blades to run. He was recently at CU Boulder testing his carbon fiber blades. "With this study in particular, we are trying to understand how the use of running-specific prosthesis affect the performance of athletes with amputations below their knees," said Alena Grabowski, an assistant professor of integrative physiology at CU Boulder. "We've done some tests on his starting block performance, his performance around curves. In a 400 meter sprint, you have to negotiate two curves. We've looked at his top speed, and we've looked at his endurance. We've also looked at his metabolic rates." In order to compete, Leeper has to prove that his blades don't give him an unfair advantage against able-bodied athletes. LONDON, ENGLAND - SEPTEMBER 07: Blake Leeper of the United States lines up on the starting blocks prior to the Men's 400m T44 heats on day 9 of the London 2012 Paralympic Games at Olympic Stadium on September 7, 2012 in London, England. 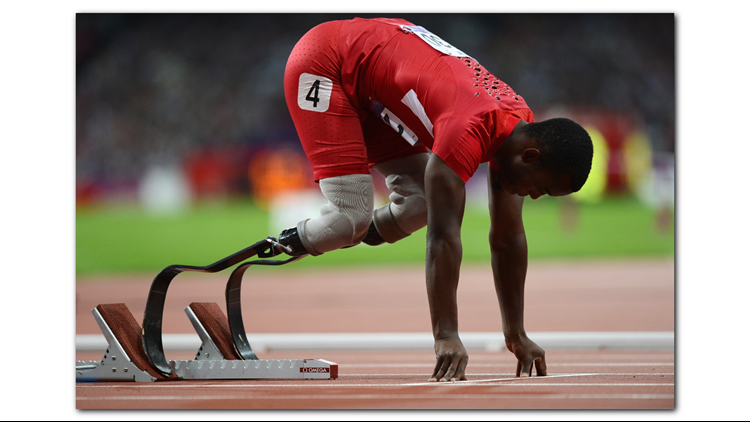 A 2007 rule created by the International Association of Athletics Federations (IAAF) prohibits "mechanical aids" unless amputee athletes can prove their prostheses do not give them a competitive edge. Grabowski researches biomechanics and physiology and played an important role in determining Pistorius did not have an advantage - a finding that allowed him to compete in the 2012 London Summer Olympics. Pistorius was convicted in 2015 of murdering his girlfriend and sentenced to more than a decade in prison, but he was the first double amputee to compete against able-bodied runners at the Olympics and his running achievements inspired other athletes -- including Leeper. According to a CU Boulder article, in June, Leeper ran the 400-meter sprint in 44.42 seconds, shattering his own record and that of Pistorius. That same article states Leeper believes he faces numerous challenges that he sees as disadvantages -- including sores and swelling in his stumps and balance problems that make it harder to lift weights at the gym. Grabowski says data collected from Leeper is now being analyzed. She expects to have results in the next few months. The IAAF will use the completed research to determine whether Leeper can compete.